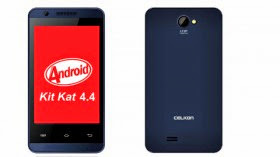 Cheapest android Kitkat phone is now launched by Celkon in Indian market for . This android phone have android KitKat (latest android OS) as its operating system. You can buy this phone from online stores like Flipkart, Snapdeal, Amazon. Price of this new phone is kept only 3K INR. This is very cheap price as compare to other KitKAt android phones. Indian cellphone manufacturer Celkon launched its Campus A35K for 2999 INR in indian market. Even after low priced this phone has very good configuration. It has 1 GHz processor with 256 MB RAM. Also camera is of 3.2 Mega Pixel and it has front camera also which is 0.3 Mega Pixel. You will get Battery, Adapter, Earphone, USB Cable and manuals with phone. Celkon Campus A35K is touch screen, dual SIM mobile phone with Features like Email, Loud speaker. Mobile will support both type of networks 2G and 3G. Operating Frequency for GSM network is - 900 MHz,1800 MHz and for WCDMA network is 2100 MHz . It has 1 GHz of processor with 256 MB RAM. Operating system is Android KitKat. Display is IPS LCD and screen size is 3.5 Inch. Screen resolution for this mobile is 320 X 480. Providing GPRS, EDGE, 3G, Wi-FI, Bluetooth connectivity facility . Phone also has GPS and USB connectivity. Internal Memory 512 MB which is further expandable upto 32 GB. Size 119x63x10.7 mm having weight of 102 grams only. Please give your reviews and feedback in comment about this Cheapest Android Kitkat Phone.